Today outside a sit-in at the Red Cross in Ramallah I met with Nariman Al Tamimi from Al Nabi Saleh village. Nariman is an ex-prisoner herself and the wife of the political prisoner ‘Bassem Al Tamimi’. As a resident of the village her family has been suffering from the Israeli occupation on a daily basis. In the space of 5 years she has been shot a total of 7 times, while her eldest son Wa’d who is 14 years old has been shot with rubber bullets over 10 times. Furthermore, their house faces the threat of immediate demolition by Israeli forces. Due to her history Nariman has became a symbol of ‘somoud’- steadfastness- to many Palestinians. Despite the endless tragedies she is continually facing she never wavered from demanding for her and her people’s full legitimate rights. Today from the sit-in in Ramallah, Nariman wished to send a message to the world urging them to take solidarity actions with the hunger strikers in Israeli jails. “I want to tell the world about international law and all the human rights resolutions that are meant to protect human rights including the rights of prisoners of war. I would like to ask why these laws are not protecting our prisoners? Why are the human rights activists are not doing anything regarding the Israeli violations? Why is the world still silent? 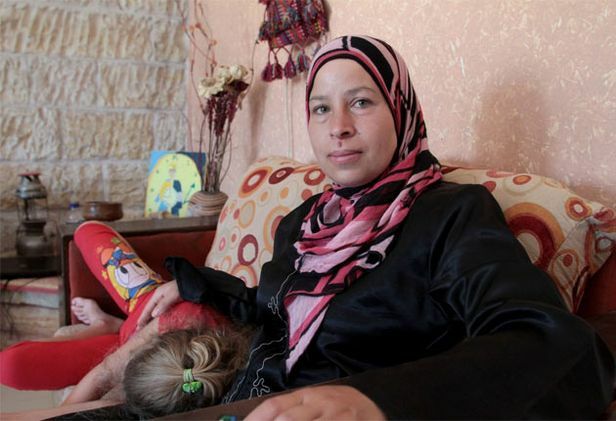 -There are well over 120 women in Israeli prisons, 17 of these women are mothers. 2 of which gave birth in prison. The youngest female currently held is 12 years of age. -The majority of these detainees are being held in violation of the IV Geneva Convention in prisons outside of the West Bank and Gaza Strip.